Tick Tock, the clock moves towards midnight. Life is about to be turned upside down for one small town as the border crossing is sealed shut, dividing here from there, us from them, this from that. In the midst of it all, Stranger, a young girl’s beloved dog, has gone missing. Tick tock. Will Stranger be found before the border closes, or will he be trapped forever on the “wrong” side? With rumours of dog theft and whispers of runaway immigration, how far will the mayor dare to go in her fight for re-election? Does the refugee boy hold the clue to Stranger’s disappearance? As the bickering and bartering over boundaries moves into the eleventh hour, will one young girl change the course of history in her quest to find her dog? The Border is an outrageous Brechtian parable that explores the lines we draw between ourselves and other people. 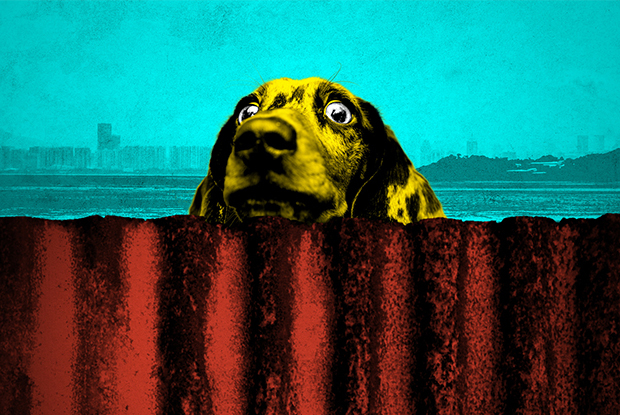 Fusing Theatre Centre’s expertise in new writing with energetic staging, The Border will feature a live break-out debate where one girl, her dog and the audience find their voices – and their bark. Directly links to study of Brecht and Epic Theatre in the GCSE Drama curriculum. An opportunity for GCSE Drama students to fulfil their live Theatre Production evaluation and review. Offers strong links to PSHE and Citizenship curriculum including human rights, diversity and living in the wider world. Facilitates a compelling, relevant and accessible discussion around borders, community and current changing political and social landscapes. Written by one of the UK’s new writing talents, currently also working with The Unicorn and Bush Theatre. Quality assured by Theatre Centre’s 65 years of experience in producing plays for schools’ touring. Theatre Centre is an Arts Award Supporter and Artsmark Partner, and our productions are suitable for students working towards all levels of Arts Award.